So Gabriel has reached the phase in this whole “Bike Riding” thing that he felt like he was ready to take his act on the road. During the summer months we loved taking long walks outside around our neighborhood. There was recently a path built for a walking trail, but it was also unpaved and rocky. One day while we were getting ready to go for a walk, Gabriel and Angel asked if they could ride their bikes. Everyone else was walking, but they thought it would be neat to take their bikes and enjoy the ride. Their older brother Israel thought he would take his bike out with them so they wouldn’t feel alone riding and he could also teach them how to cross at stop signs, and look both ways for traffic. It was settled, and they got their gear on….CHECK! They also got their bikes out….CHECK! Now….they were ready to go. We all headed out the house and began our daily walk. It went pretty well at first, they followed right behind Israel, and listened to his instructions. We were very close behind, watching and enjoying the fun they were having riding out in public. The paved roads were smooth, so no real problems there with the terrain. But, eventually the paved road came to a stop, and the dirt/rocky road began. They both noticed that the road was different immediately. First, they came to the grassy part. Riding a bike through tall grass wasn’t easy. Being 4 feet tall made this grass seem lik the gunggle. They were scared that bugs were going to get their legs. The bike wouldn’t move at all and they had to make EVERY EFFORT themselves to get out of the GRASS if they wanted to make it to the dirt road. They finally did, but not without some weeping and gnashing of teeth. Once they reached the rocky road, they were relieved to be on flat dirt. They began the momentum again of pushing and the bikes would roll a couple of feet, but then they would stop. Wasn’t as easy as the paved roads. Gabriel began to complain because he saw his big brother rolling ahead of him, and that made him feel left behind. Angel, well……she had given up a long time ago and just started walking. Gabriel on the other hand, was determined to keep going. He wanted to keep up with his brother so badly. But every push he made, his brother seemed to get further and further away. Israel would turn around to hear his brother yelling his name, “ISRAEEEEEEEEEEEL…..WAIT FOR MEEEEEEEEEE!!!”. His brother would stop and wait for him to catch up, but the process seemed to always start over again when Israel would move forward. See, the dirt road didn’t bother Israel because he was older and had more experience riding his bike, and with his age came strength. His legs could handle the rough road. He had done it before, and learned just like Gabriel would, how to navigate through it. Gabriel didn’t understand why it was so easy for Israel, and even when Israel tried to explain, the explanation didn’t make him feel better. Eventually Israel road up ahead, and as mommy and daddy followed behind watching it all take place, Gabriel started complaining about his legs hurting. He was trying so bad to push through and his little legs were getting worn out. Finally, the bike stopped and Gabe got off and stood there. Tears ran down his face because he really wanted to make it. Daddy eventually walked over to him and asked him what was wrong. Why did he stop (though he already knew). He began to explain as best as a 5 year old could….that he just couldn’t go any further. He wasn’t as fast as his brother, his legs were short, and they hurt, and he just was discouraged. He couldn’t go any more. Daddy had watched the entire time and knew exactly what would happen. In fact, Daddy knew before we left the house that this would happen, and he told Gabe, “are you sure you want to do this?”. Of course Gabe, not knowing what was up ahead, said YES! So, Daddy prepared himself to be ready for the moment when he might not be able to continue it alone. So…Gabriel feeling defeated, bowed his head and surrendered his bike to Daddy. Daddy in turn encouraged Gabe that it was ok….that he would eventually get to the point that Israel is at in riding his bike. The more he practices, the better he would get…the more energy and strength he would have and one day he would ride his bike on the dirt rocky road with no problem. Until then…Daddy assured Gabe he would help him the rest of the way home. 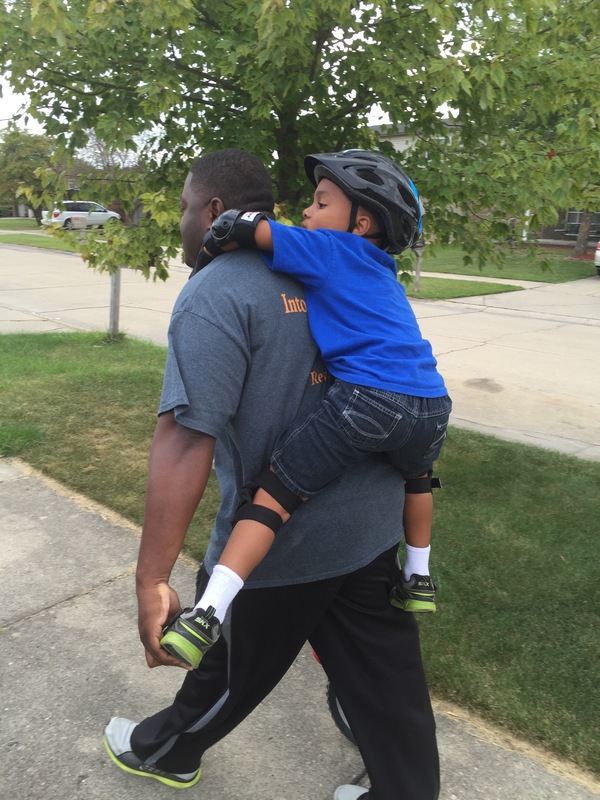 Daddy grabbed the bike in one hand….and then picked up Gabe with his other hand and placed him on his back. Then the family began the walk back home. 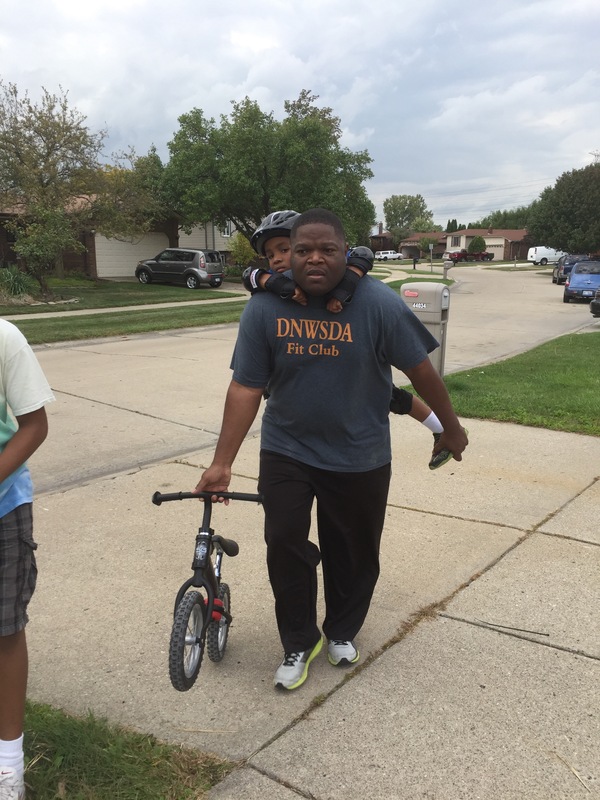 Angel was holding mommy’s hand, while mommy carried her bike…and Gabriel rode home…..on Daddy’s back. He didn’t even have to worry about his bike, daddy had that too. On this Christian Journey…….God the FATHER abides with us each and every day. He is watching us mature and grow, and fall, as we walk along trying to figure it all out. He speaks to us directly, just as Gabriel’s father spoke to him before he left to go on the walk. He lets us know that it will be challenges ahead. Sometimes we listen to the warnings and choose to go another road…and other times we feel very confident that we can handle the dirt and rocks. But….in true Daddy fashion, our FATHER IN HEAVEN is walking right I front of us, behind us and along side us. As we are watching our Brothers and Sisters succeed, sometimes we can feel very small, and unaccomplished. We can get discouraged and tired of the journey, watching everyone fly by. Asking questions such as, “Why are they doing so well?”, “Why can’t I be where they are”, “Why is it so hard for me?”. Ultimately feeling Tired and want to quit.